As reported earlier this month, Baruch College—in partnership with the Dormitory Authority of the State of New York (DASNY)—is working to upgrade the HVAC systems of the North Campus. An important piece of this $14 million capital project is replacing the cooling towers on the roofs of the Newman Vertical Campus (NVC) and the Information and Technology Building. These towers play a significant role in the maintenance of temperature. This past Saturday, Jan. 28, a street crane successfully removed the existing cooling towers of the Information and Technology Building (see image left). The downside of removal, however, is that there is no direct way to modulate the temperatures throughout the NVC and the Information and Technology Building while work is in progress. Be advised that campus engineers are doing their best to accommodate temperature-related complaints. The problem: When heat is reduced in one area, another area becomes even colder, and vice versa. Unfortunately, we anticipate that this situation will continue through this week, until the temporary chiller‒moved to accommodate the crane and other connections‒is back in operation. 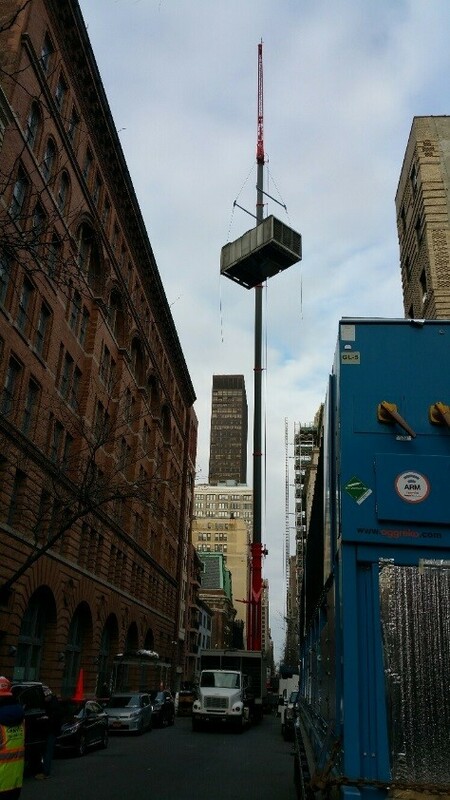 Expected to be operational by Monday, Feb. 6, the temporary chiller will make it easier to modulate temperature. The first of the new cooling towers should be operational at the end of March or beginning of April, and the entire project is scheduled for completion this summer. When completed, this upgrade will allow campus engineers to control the numerous components that balance the heating and air conditioning to the North Campus floors and rooms. We apologize for any inconvenience and will continue to keep you apprised of developments. 2. Enter your Baruch e-mail address on this online form. Students will be selected at random from the list at 7:00 a.m. on February 4, 2015 and notified by e-mail to come to the circulation desk to pick up the calculator. Students who are selected from the waiting list will have until 10:00 p.m. on Tuesday, February 10 to pick up the calculator. Calculators that are not picked up by that time will be distributed at the 2nd floor circulation desk on a first-come, first-served basis beginning at 9:00 a.m. on Wednesday, February 11. Each student may only submit one entry to the waiting list. Multiple entries will result in disqualification from the calculator loan process. Entries must be submitted by 7:00 a.m. on February 4. Baruch College is participating in The New York Power Authority’s Peak Load Management Program, which requires the curtailment of Electricity. All departments must turn off all non-essential equipment such as lights, computers, printers, copy machines, etc. – Please note that this includes the equipment in the Library and the computing labs. Escalator and Elevator service will be limited. All windows must be closed. Window AC set points should be raised to 77F. 646-660-6030 or Buildings and Grounds Office at 646-660-6630. The College is extending hours to accommodate Baruch students who now have additional class meetings, assignments and exams loaded into the weeks before the end of the semester. Your academic progress is a priority. We hope that you and your families are well and recovering from the disastrous impact of the hurricane. The Newman Library will reopen on Monday, November 5 at 7:00 a.m. following the closure of the Baruch College campus since October 28 due to Hurricane Sandy. The Library will be closed on Saturday, November 3 and Sunday, November 4. Baruch College students may now use the Newman Library’s online Group Study Room Reservation Service to reserve a room up to one day in advance. After logging in with a Baruch username and password, users see the availability of the rooms that hold 2-3 people and the rooms that hold 4-8 people. For rooms that are marked “available” a reservation may be made for a period of up to 3 hours or until room closing time, whichever is shorter. Only one reservation per user is permitted per day. Users still need to charge out the room key at the circulation desk. Reservations are automatically cancelled fifteen minutes after starting time if the key is not checked out at the circulation desk; the room is then made available to other users on a first-come, first-served basis. For more information about the service, please visit the Newman Library’s circulation desk.